Cost to move a piano varies greatly by region (and even by zip code). Get free estimates from piano movers in your city. Cost to move a piano varies greatly by region (and even by zip code). Get free estimates from piano movers in your city. The cost of moving a piano is $600-$2,000. Moving a piano is not like moving a piece of furniture. Most often than not, pianos are treasured family heirlooms that have been passed down from generation to generation. Depending on the make, size and age, it can cost anywhere between $3,000 to $100,000. Moreover, pianos are very heavy (close to 1,500 lbs) and require special boards and dollies to transport them safely. A professional piano mover who can transport your valuable possession with the care it deserves is the right choice for this job. For moving a studio upright piano within the same city with one flight of stairs at the origin, you can expect to pay around $600-$2,000. While it can be tempting to go the DIY route and save money, you may end up losing more money if you move it the wrong way and end up injuring yourself or causing damage to the instrument. Despite their bulky appearance and heavy weight, pianos are delicate instruments with more than 1000 small parts. Even regular movers may not be experienced enough in this area. This is why the best way to move a piano is hiring a professional piano mover who understands the instrument and has the experience and tools to take it apart and reassemble it if necessary. Typically, your piano mover will ask for the following information to come up with a quote. Depending on the type of piano and difficulty level of transporting the instrument to and from the truck, you can expect the move to cost as given below. Your moving company will ask for the type, size, make and model of the piano to calculate the costs, determine the value, and estimate labor and tools required for the job. Make sure to specify the piano correctly as upright or grand. While measuring the size of an upright piano, measure from the floor to the lid. If you have a grand piano, you should measure from one end of the keyboard to the bow. Obstacles that add to the difficulty of moving the piano in and out of a house can greatly increase the total costs. For example, if your piano is located on the second floor of your house, be prepared to pay an additional $2-$10 per step or $40-$100 for every flight of stairs. Every stairway turn can set you back by another $75. Other obstacles like difficult terrain (dirt, gravel or trees in the moving path) and narrow spaces can also increase piano moving costs by as much as $200. If you live in a small town or area, chances are that there are not too many professional piano moving companies in your area. Plan your move in advance to get your choice of piano mover and a reasonable price. Rush jobs can increase your final costs by as much as $300. However, avoid placing a time limit on the move as it can increase the cost. The more flexible you are, the more money you will save. Be prepared to be available all day on the day of the move. Piano movers usually arrange their schedules in a way as to make the most efficient use of time and fuel. Some movers may be able to give you a quote just by the type of piano. Typically, their rates would be as follows for a short-distance move. While piano moving may seem like a simple task to the uninitiated, it is a complicated process and requires proper training. You can expect professional piano movers to turn up on the moving day with a specially-equipped truck, ramp, moving dolly, skid board, locking belts, moving pads and blankets. They will also have the necessary tools to dismantle the piano for transport if needed. Smaller pianos are usually moved in one piece. If you have an upright piano, your mover may start by placing a blanket on on side of the piano. Then the movers will lift the other side and position the dolly right in the center below the pedals. 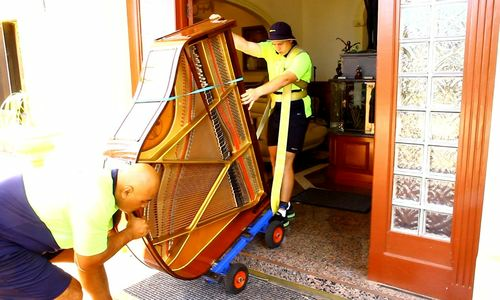 While moving a grand piano, the movers may choose to remove the three legs, the pedal box, and the music rack and then tilt the pian on the long end onto a skid board. Always make sure the piano’s lid is closed and locked to prevent any damage to the keys during transport. The body should also be covered with moving pads and secured with tape to prevent scratches. Piano moving requires special boards and dollies that are used to transport heavy items without causing damage and may not be ordinarily available around the house. Professional piano movers may also have specially-equipped trucks with ramps, hydraulic lifts, and several rings and clips to secure the piano properly during transport. Your piano mover may either charge you by the hour (with a three-hour minimum in most cases) or give you a fixed rate. Depending on the instrument’s weight and size, the mover may employ 2-5 employees for the job. The hourly rate ($8-$15 per person) will generally include cost of labor and equipment used. Fixed rates are generally in the range of $150-$400 for a short distance move. If your new home does not have enough space to accommodate a piano or you need to store your piano temporarily for some reason, you can arrange your piano to be stored in a climate-controlled facility for $50-$60 per month. Lifting a piano using a crane through a window can cost you around $750-$2,000 more. Carry/transport the piano on its end and not its side. Laying down a piano on its side can play havoc with its internal workings. Be sure to check if the piano is securely strapped against the side of the moving truck to prevent damage. If the piano has to be moved outside, make sure it is wrapped in plastic sheets or blankets. Never try to catch a falling piano. If the piano falls on you, you could die or suffer serious injuries. Never roll or push a piano around on its casters. They are mostly decorative and can cause damage to the floors, especially if you have carpets or hardwood finishes. Also, if you had kept the piano in the same place for a long time, the casters may have deteriorated in strength and pushing can cause the legs to get jammed and snap. Always choose a licensed and insured mover. Make sure the company’s insurance includes accidental damage to property, piano replacement, and workers’ compensation. If you need to purchase additional insurance, you can do so at $7-$15 per every $1,000 of value. Ask your piano mover for a written estimate that includes the make and model of the instrument. Try to get multiple estimates to get a better understanding of the piano moving costs in your area. You can save some money and bring your piano moving costs down to $275-$400 by transporting the vehicle yourself and hiring a piano mover(s) to do the packing and loading at the origin and unloading and unpacking at the destination. You may need to retune ($150-$300) the piano after moving to account for climate and humidity changes. High humidity can cause the wood to swell and expand, pulling the piano strings taught and creating sharper notes. On the other hand, if you move to a low-humidity area, the strings may go flat or form splits, causing buzzing. However, do not tune it immediately. Give it time to adjust to the humidity in the new place. Generally, moving quotes do not include waiting time. If you are not ready at the scheduled moving time or if no one is available at the new location to accept the delivery, your mover may charge you additional fees for waiting. Rescheduling fees can be as high as $400. Remember to take pictures of the piano before it is packed and again before it is unloaded from the moving van to document any signs of possible damage. This can help you if you have to make any insurance claims later. How much does it cost to move a piano in my city? Cost to move a piano varies greatly by region (and even by zip code). To get free estimates from local contractors, please indicate yours. We have added an image of the project, and a summary at the beginning with the cost of moving a piano to help the user better understand the project, and an index to take you directly to any part of the guide. The cost guide has been remade adding more information and updating the cost. The "Cost Breakdown" section has been removed because there wasn't enough information about the process and cost. The sections "Professional movers vs. DIY", "Cost factors", "Piano type moving costs", "Process", "Moving equipment", "Labor" have been added and now there is more detailed information about the different options and possibilities with their costs. For example, you can find a new table with the cost of moving different types of piano withing the same city. Moreover, new options have been added as enhancements, that may not be included in the average project, but may interest you. The "Additional considerations" section now offers information about insurance, things to bear in mind and tips to hire the perfect movers and how to save money. And for any other piece of information that may not be found in other sections, you can go to the new "Frequently Ask Questions" section where you'll find an answer. Cost breakdown was written correctly, as it was impossible to understand, because of different typos. Cost breakdown is now correct and easy to understand.